Stretch often. Always start of by doing some gentle stretches to get the body ready to work. Don’t forget to stretch while taking breaks and stretch once the tasks are finished. Proper technique. Using the right moves can go help you rake and clean up without the ache. By positioning the body correctly you can reduce strain on the muscles and joints and avoid injuries. Alternate. Remember to alternate tasks between heavy and light. This will allow you to reduce the amount of strain experienced at one time. Lift right. Ensure your back is straight. Always bend with your knees. Carry the load close to your body. Avoid heavy lifting immediately after bending or kneeling. Avoid twisting and bending your back while lifting. Vary your position. Check your posture and change your position often. Kneel, then stand. Take a break. Don’t forget to take small breaks to rehydrate, rest, and do some simple stretches before getting back to work. Spread it out. Distribute tasks over a few days so you can take more breaks and limit the amount of strain experienced on each day. Rake right. Ease the strain on your back by putting one leg in front of the other. Switch legs and hands from time to time. 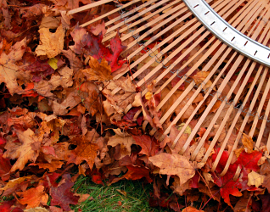 Hopefully these tips will help your fall clean-up be less of a pain in the back. If you do end up with some pain or discomfort, the team at YOUR HEALTH Wellness Centre is here to help. If your pain is severe or lasts longer than 48hrs, it is your body’s way of saying that something is wrong. Call in and see one of our Chiropractors. They are trained to diagnose and treat your muscles and joints and help you get back to your pain-free life.